The whole world has been waiting for a Jackie Chan and Jet Li collaboration for years. Now that it has arrived, was it worth the wait? My honest answer to that question would be no. The movie was actually quite alright, but the fact that it stars Chan and Li together for the first time…well, lets just say that it did not live up to expectations. The first mistake you could see with the film is that it’s a Hollywood production, and not an Asian production. It’s directed by Rob Minkoff, who previously did ‘The Haunted Mansion’, both ‘Stuart Little’ movies, as well as ‘The Lion King’. What??? I would really like to know who was responsible for making that awful choice. Now don’t get me wrong because I love The Lion King but this is just the wrong choice for such a movie. Is every other action director in Hollywood busy? How about the Hong Kong directors? I believe a movie pitting these two legends would have been much properly handled by Asians, and not bastardised by Hollywood. Jason Tripitikas (Michael Angarano) is a kung-fu freak who watches a lot of Kung Fu inspired Asian movies. He has his bedroom wall covered with posters of Bruce Lee and even has dreams of the Monkey King fighting on mountain tops. However, he doesn’t know how to fight at all. He often visits this one pawn shop in Chinatown to get his supplies of bootlegged DVDs. One day, he stumbles upon a golden staff, which is apparently awaiting its rightful owner. Though Jason is not really the rightful owner, he is transported back to Ancient China to deliver the staff to the true owner, who happens to be the cause of his wet-dreams himself, the Monkey King (Jet Li). 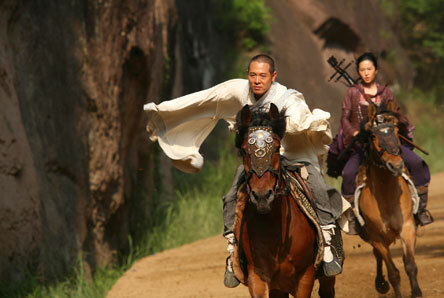 See, 500 years ago, a duel took place between the Monkey King and the Jade Warlord (Colin Chou). Betrayed, the Monkey King was turned to stone by the evil Warlord, but not before he cast away his magical staff. Now the staff is the only weapon that can free him, so that he can destroy the wicked Warlord once and for all and bring peace back to the land (if you’re scratching your head now, not to worry as I did that too in the cinema). 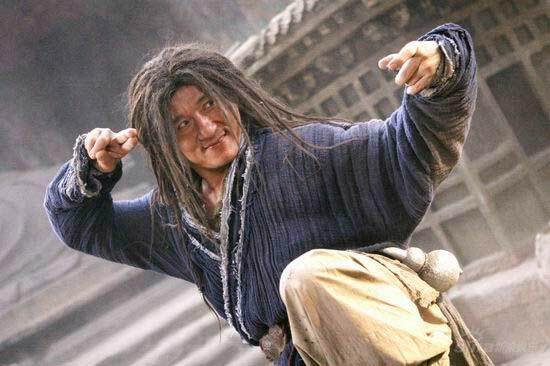 Once there, Jason meets up with Lu Yan (Jackie Chan), a hermit who specialises in the Drunken Fist-style of Kung Fu. He also meets Golden Sparrow (Liu Yifei), a young orphan who speaks of herself from the third person view, and the Silent Monk (also Jet Li), a monk who has been searching for the Golden Staff all his life. 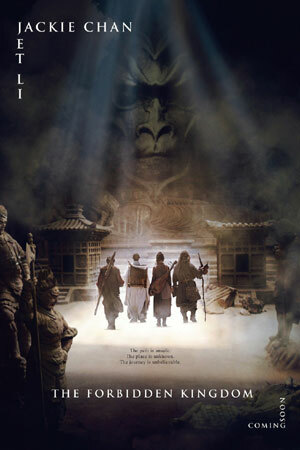 Together, their mission is to bring the staff over to the Mountain of 5 Elements, and free the Monkey King. Along the way, Jason learns Kung Fu from the two teachers everyone can only dream of being taught by, and also falls in love with the Golden Sparrow, who’s on a mission to seek revenge from the Jade Warlord for the loss of her parents. Adding to the mix is the white-haired witch Ni Chang (Li Bingbing) and her band of eye-shadowed thugs, who pursues them. If I am to write more, not only will I give away the story but I am going to get a massive headache as well. I refused to write this review at first due to the complexity of the storyline. Now, the problem. There’s Chan and then there’s Li. So, what’s up with the white-boy lead? Now I don’t really have too many problems with this guy. He wasn’t annoying or anything like that, but it takes the attention away from Chan and Li. I feel that the story should have focused more on the duo and less on other characters, considering that everyone who paid for this movie, only paid to see those two. We got one decent fight scene between the two but there could have been more. Since you already managed to get these two together, hell, make the best of it. I also have a problem with the whole Western influence in this movie. They should have made this film like other Kung-fu flicks and maintain the Asian-ness. Asia’s art and culture is rich enough without outside influences. Now, this also brings me to the language. Every English-speaking person in the known world knows that Jackie Chan is the worst English-speaking person on the planet (Jet Li is much better, but still). Was it really necessary to have English as the spoken language of the film? I had to read the Malay subtitles throughout the whole film as I do not understand a single word that came out of his mouth. Then again, isn’t that one of the reasons we love him for? Having said all that, the movie was still entertaining nevertheless. 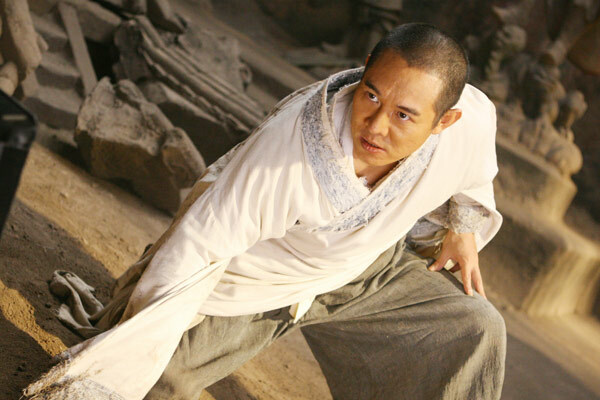 Jet Li, besides playing the Silent Monk, also plays the Monkey King, who is an expert wielder of the staff and funny as hell with his monkey-like antiques. Colin Chou was superb too as the Jade Warlord, though he looks a bit too young to be playing a Warlord. Both the Monkey King and the Jade Warlord had a couple of duels, and both were truly entertaining. Overall, the action was good. As for the cinematography, there were certain scenes captured beautifully but I wasn’t sure if it’s computer-generated or not. Looks rather fake. Beautiful, but fake. As far as the story goes, it gets very complicated once the fantasy elements came to play. There was this one whole scene about the Jade Emperor, and a peach tree and they were in heaven or something. That whole part was way too complex and superfluous. My final verdict for this film is…well, to watch it. Despite all of my protestations, the movie is obviously a popcorn-flick and quite entertaining with plenty of action sequences and comic-relief. Plus, we do not know when we’re going to get to see these two again on the same screen, so watch it even if its just for their duel scene. I regret that this movie was poorly executed by Hollywood and hopes that if such a movie is to be made and in the future, please let the Asians handle it and cast aside all the ridiculous fantasy components.